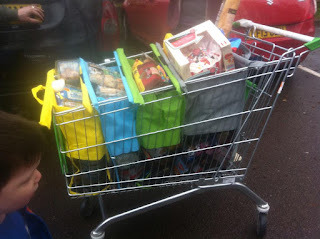 Mum of Five Staying Sane: Our review of Trolleybags shopping bags, making food shopping a doddle. Packing your shopping made easy, less stressful and no more 5p carrier bag charges. Our review of Trolleybags shopping bags, making food shopping a doddle. Packing your shopping made easy, less stressful and no more 5p carrier bag charges. We were recently sent a set of Trolley bags to try out and review. I was quite excited by these, I am the main food shopper in our house so it always falls on my shoulders to drag the trolley around the supermarket and get the shopping done. I headed off to my local supermarket armed with my Trolley bags and a toddler! Trolley bags come in a set of four reusable bags in varying sizes but all designed and tested to carry up to 15kg. They all have carry handles and rails that sit along the top of the trolley letting the bags hang nicely and fit snugly into the trolley to pack your shopping. Trolley bags fit neatly into your trolley ready for packing either whilst you 'Scan and Go' or once you are at the checkout. Whilst not in use they all velcro together and then roll into a nice handy carry size which I then hung on the back of the trolley. If using the 'Scan and Go' shop you can place them directly into your trolley and fill up as you go. Positioned and ready for action. 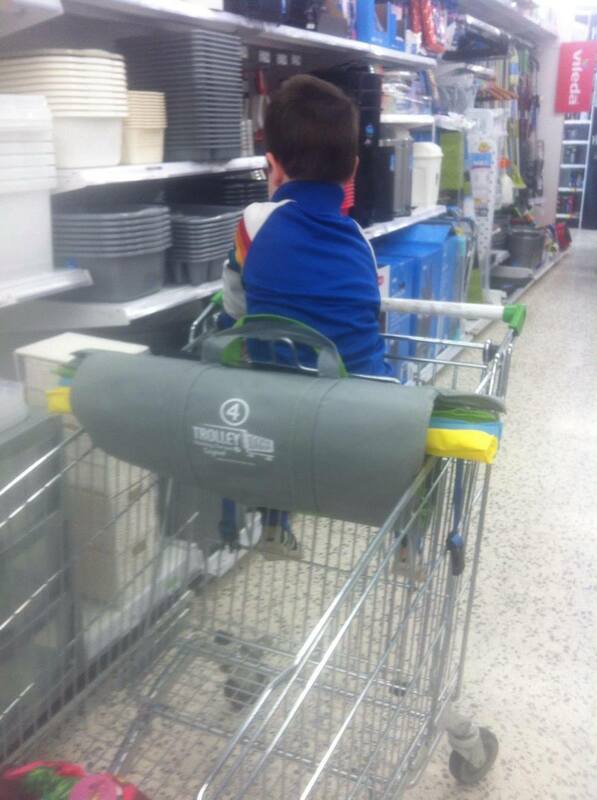 Easier without a toddler in the seat, he was evicted at checkout! Once I had finished my shop, always more than I initially went for, it was time to head to the checkout. Once I had emptied my shopping at the checkout I went to the other end and opened my Trolley bags in the trolley in one easy motion. Always try and fill the bigger bag with the lighter, bulkier items and place heavier items in the smaller bags. I did find on another occasion that when I was still unpacking my trolley the cashier was keen to get scanning but this wouldn't have worked as I needed to get the Trolley bags into my trolley and ready to pack so I made her hold off just for a minute. Packing was so easy, everything got put into a certain bag depending on what it was weight or size wise. I managed to fit £150 worth of shopping into the four bags and getting them packed in the car was so easy. Usually if I have done that amount of shopping there is easily 15 carrier bags of shopping if not more. you find that you can never fit it al back in your trolley once it's paid for and then you have to load 15 bags into your car and then out again when you get home. Not with Trolley bags! They were so easy to use, and having only four bags to move from trolley to car and into the house was great. I had quite a few people looking at the Trolley bags whilst I was at the checkout, I have only ever seen one other person using them in my local supermarket and so people were interested to see them in action and once they were positioned in the trolley it was so easy snd quick to get the packing done without getting annoyed by endless carrier bags. My full loaded trolley complete with full weeks shopping inside. 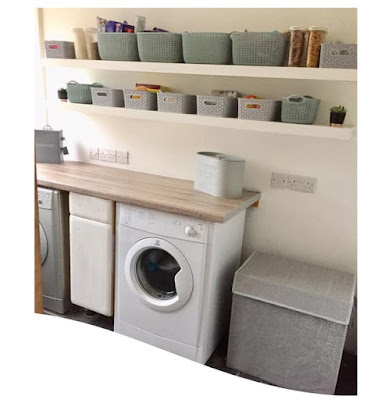 They velcro together in the trolley but are easy to pull apart to life out of the trolley once packed and then once they are all unpacked at home you just roll them up together to await their next shopping adventure. Trolley bags come in two different sizes the Trolley bag Original and the Trolley bag Express for the shallower shopping trolleys. They are also available on the pastel colours which is they grey, green, blue and yellow set or the Vibe colours which are the brighter blue, red, green and orange set. Priced at £17.99 I think they are worth it. I was constantly going out shopping and forgetting my carrier bags and would end up buying more but now I just grab my Trolley bags and away we go. Disclaimer; We were sent a set of Trolley bags for the purpose of our review. all thoughts and comments expressed are our own. These look like such a great idea. I would definitely use them if I went to the supermarket shopping. I do my grocery shopping online. hello I am from Africa, this is a great Idea, I will like to sell the trolley bags I myself, wont I face copy rights strikes? or I just have to buy a bulk of them and sell? Hello< my email address is snkosiyethu@yahoo.com.hello I am from Africa, this is a great Idea, I will like to sell the trolley bags I myself, wont I face copy rights strikes? or I just have to buy a bulk of them and sell?